Here at the Acorn Centre, we have an I.T. Suite. The Suite is equipped with new computers, with up to date software. The room can be hired out for group bookings such as schools and courses. We also run I.T drop-in sessions during the week where people can come along to get tips and advice about using a computer, learn new skills or get help in using the Internet. The I.T suite is also used for the Community Employment Hub. This is our IT suite boasting up-to-date computers and office software packages, with the computers all networked together and connected to the Internet at the centre. 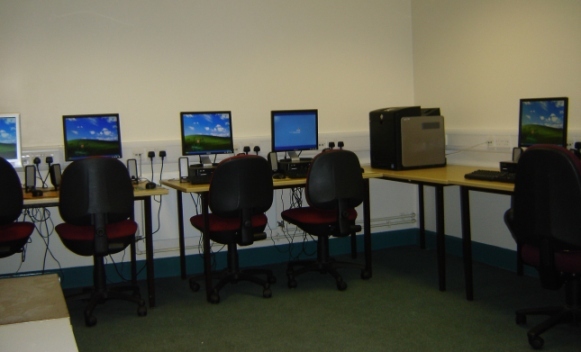 There are 8 computers for clients and one is a tutor system that allows the user to interact with the other 8 computer desktops and assist the users without having to move the student away from the screen. All the systems in the suite have a common ‘My Documents’ folder, making it easy for users to access files they save from any of the computers in the suite. Ideal for education, training and cyber events. We currently have a range of IT courses available for the newcomer to the computer, the novice and those who have made a start and want to extend their skills. Please pop in, phone or, if you’ve passed the first hurdles already, email! One of these courses is UKOnline’s MyGuide.